Jake Dennis was only able to make the fourth and sixth rows of the grid for races two and three of the FIA Formula 3 European Championship weekend at Hockenheim after getting caught out by a red flag again in qualifying this morning. The RSF-backed Prema driver - who was similarly compromised in first qualifying yesterday - was odds on for the fourth fastest time overall in the drizzle-hit session when the red flag came out as he was about to cross the line. The lost lap left him relying on his previous best which was only good enough for seventh on the grid in race two. On second fastest times, which establish the grid for the final race on Sunday, he qualified 11th. Prema team-mate Felix Rosenqvist dominated the session delivering another two pole positions to add to the one he wrapped up in first qualifying yesterday for this lunchtime's race one.Van Amersfoort's rookie Charles Leclerc joins him on the front row for both races. "I got a red flag just before I crossed the line which was quite frustrating to say the least," he said. "Without that I'd have been P4 and P7. "There were a lot of crashes to contend with as well which made life a bit difficult. But that's the way it goes sometimes. You just have to grin and bear it." Yesterday, The RSF-backed Prema driver qualified sixth after running into traffic in the red flag-interrupted session. The Prema drivers, including Dennis, hit the track first, stopping two-thirds of the way through for fresh tyres in preparation for an end-of-session blitz on pole. That went to Felix Rosenqvist who, like his team-mate Dennis, got one chance only for a hot lap. The Swede seized it to turn in a traffic-free 1m 32.455s lap which edged Carlin's Antonio Giovinazzi to the top spot by just over one-hundredth of a second. Dennis was less fortunate hitting congestion in a couple of early runs and then returning to the circuit as the session was red-flagged. His best lap of 1m 32.960s left him just over half a second off pole. He joins Prema team-mate Lance Stroll on row three. "Unfortunately there was a red flag when I left the pits so it ended up pretty much as a one lap session," he said. "Luckily that was good enough for P6 even though I was held up. "Without the red flag it was looking like P2 or P3. But that's just one of those things, I guess." 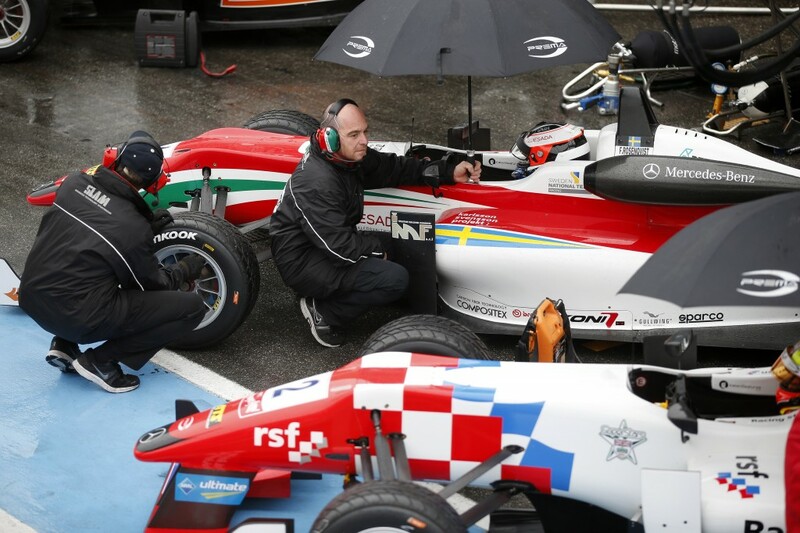 Despite the difficulties four Prema drivers made it into the top 10.